Newspapers report every day how our world is changing because of digital technologies. We often read about full automation, digitalization of life and the end of work. All these themes are interwoven in the sharing economy: apps that connect supply and demand to share a particular good. Foodora is not one of them, as nothing is shared. Foodora is part of the gig-economy, like Uber, MechanicalTurk or Task Rabbit. Foodora offers restaurants the possibility of new customers by providing a flexible fleet of couriers. An app monitors purchases and assigns them to the couriers based on an algorithm that calculates speed and distances. Restaurants get new orders without employing any more people, paying 30% only on completed deliveries, meaning they have no additional costs. Customers get the food they want from a great variety of restaurants, at home, by paying €2.90 per delivery. Young cyclists, who the company calls “riders” (even in Italian), get to earn some money by moving through the city in their free time. Foodora, the once-small Berlin-based startup has grown into an international business, located in 10 countries and 36 cities. It opened in Italy two years ago, starting in Turin and Milan (northern Italy) and will soon be expanding to Rome, with prospective sales volume growing at a rate of 75% every month. Currently the riders, roughly 300 in Turin and 600 in Milan, are not directly employed by the company. Instead, they are employed using a contract structure known as “co.co.co” (“contract for continued collaboration on a project”). These contracts effectively result in the riders being regarded as autonomous workers collaborating with the company, which enables the company to bypass several labour regulations which apply to direct employees. It’s been sold for a figure of several tens of million of euros yet Foodora has the typical appeal of a startup: young and friendly international people working in an open space office in Berlin and young students delivering food by bike as an easy side-job. It landed in Turin as a mirror image of the Berlin base. The managers, all under 30, meet every so often in a co-working space in the city center, are informal and speak using English words. The fleet of couriers are also young, educated, and are paid €5 per hour. This image started to crack when in August Deliveroo couriers in London went on strike and a month later their counterparts in Paris also protested. The reason was, oversimplifying, that once the company had attracted enough “workers”, pay shifted from a fixed scheme to per-delivery compensation only. Ever since the company opened in Italy, workers had been meeting and talking to one another informally, especially where they are waiting for new deliveries. They had held informal assemblies, sometimes even meeting with management in order to discuss many issues. 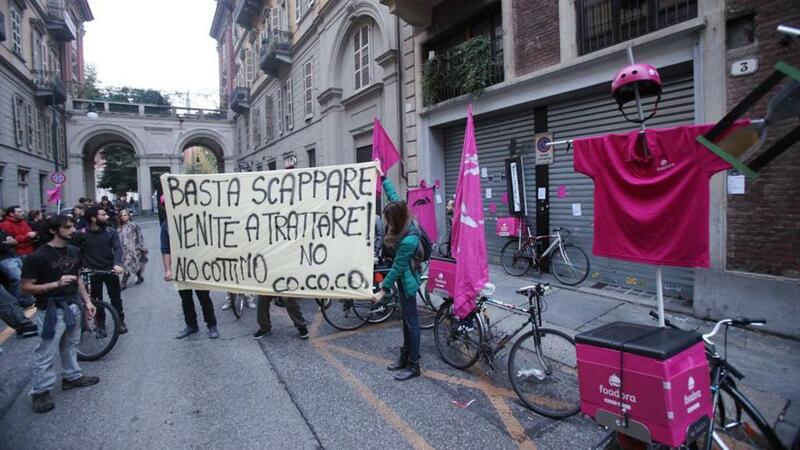 When a change in contract similar to London and Paris happened at Foodora in Turin, the protest flared up. The usual problems affecting all delivery workers are that deliveries may be in harsh weather conditions and usually involve moving a lot (60-80 kilometers per shift in Foodora’s case). Nor is it new that there are long waits for the food to be ready or the next delivery. There are, though, completely new aspects connected to the digital nature of the work relationship. Working time is 24/7 meaning there is no such thing as work/non-work division. Riders can theoretically decide when they are available, though they do not know whether they will actually work as the management decides to accept, modify or even delete the shifts, at any time, even during the shift itself. As an algorithm decides in real time the work rhythms (according to volume of requests and positions of the couriers), there are hours of absolute rush and hours of complete stand-still. Not to mention that both bike and phone are provided by the courier, with all the related costs of maintenance and repair. In some interviews workers even mentioned privacy issues as continual geolocalization goes against privacy law, especially if done by an app from the Apple and Google Play stores. All of this for €500 a month, working 25 hours a week. Riders demanded better working conditions. In May 2016, they wrote a letter signed by 85 out of 100 workers, but the requests were answered with a mix of procrastination and excuses, such as that the head of the company was elsewhere at the time. Finally, in July, a meeting took place but management said the contract could not be modified. What turned dissatisfaction into protest was that the contract could actually be changed, and the company did that. In September Foodora issued a new contract, applying to all new riders, and from November 30, to all riders. This new contract eliminates the fixed income and replaces it with a variable one: €2.70 per delivery. The number of deliveries per shift is not a factor that riders can influence, as if they were factory workers, but it will still determine their income. For an income of €500, they will have to make a delivery every half hour, at any hour, regardless of the day, time or period of the year. The managing director, Gianluca Cocco, refused to discuss the new terms with the base union, SiCobas, that the workers had chosen to represent them, saying that autonomous workers have no right to unionise. The management agreed only to face-to-face meetings with individual workers and many were removed from the group used to communicate with them or blacklisted. abolition of the “temporary collaboration” contract described above, as well as the per-delivery pay, and introduction of a flexible part-time (20 hours minimum) contract. This kind of contract guarantees sick leave, insurance and vacation. a basic salary (€7.50 per hour) with a variable bonus (€1 per delivery). halting of any threat towards and disciplinary sanctions of the protesting workers. Further demands include a proper formal communication channel with the employer (rather then a whatsapp group and an app), fair assistance from the company towards the cost of bike and phone, and proper insurance covering not only accidents but also recovery days and illness. The protest was so successful that it carried on all day, was joined by many locals and was immediately reported by newspapers, mainly because of the newness of the technologies involved. There was significant disruption of the brand image: ‘modifications’ of the company logo (from a hand carrying a tray to one carrying an iron ball with chain) and a “shitstorm” on social media where the company had to delete insults and messages of solidarity. The over-exposure of Foodora’s brand on these platforms made them a great place to show digital solidarity. All this was linked to local assemblies and street action: going to each restaurant to give out leaflets and speeches. The message spread wider, a proper boycott was launched, and restaurants started to join it. In the end a meeting with the managing director to discuss their requests was fixed for October 10. At the end of this meeting the management, both Italian and German, promised to issue a statement in response to every point. It’s worth mentioning that during the meeting a group of people from the co-working space used by Foodora came together to show solidarity and that the co-working space dissociated itself from any connection to Foodora. While management was deciding how to answer, an indirect answer came through a ‘rather strange layoff’. Two promoters who went to a riders’ assembly to understand and show solidarity were excluded from the app. Their contract was not over, but they were effectively laid off as they were not being given any shifts. The clear written answer to the protesters arrived at 00.02 of the 14th (despite a deadline of the 13th): not €2.70 euro per delivery but €3.70. The same morning the riders went to the Turin office but found it empty. No one from management showed or picked up the phone. Two labour inspectors were sent directly from the Ministry of Labour, though, to check the legality of the situation, while the Minister himself expressed solidarity with the riders. Unfortunately more and more riders were locked out of the app as they spent their day giving out leaflets about their protest. A group went to the main HQ in Milan twice, once finding it unexpectedly closed and the next time forcing the management to lock themselves in the office for three hours. Both occasions were used to meet some colleagues in the city, organizing info-events for the coming week and spreading the strike. Under the pressure from the workers the company decided to answer at least one of the demands. It issued a statement that three bike shops were authorized to give 50% discount. According to the riders, no-one has ever received such a discount. The company’s real reaction, though, was to employ a massive number of new riders, promising them at least two deliveries per hour, a promise that has been broken by either fewer deliveries per hour or fewer hours per week, and blame laid at the door of the striking riders. Two weeks after the first strike not only workers but even restaurants that expressed solidarity have been denied access to the app. From the beginning the striking riders have used different methods to decentralize their struggle: frequent change of the representative speaking with management, use of fake names and distorted voices. Once Foodora identified who it thought were the leaders, they were completely banned from any communication, although not officially fired. There are, though, interviews where workers who were ready to accept the new contract were subjected to the same sanctions, just because they took part in assemblies. How the management knew about their participation is a matter of speculation. Meanwhile labour inspectors are investigating and the workers have been received by both the municipality and the Labour Ministry. Since both occasions proved unfruitful (Foodora failed to attend the meeting with the municipality), the strikers kept on organizing several public meetings. The role of social centers and squats cannot be underestimated: media reporting and coverage as well as practical solidarity and support came immediately from local grassroots movements. 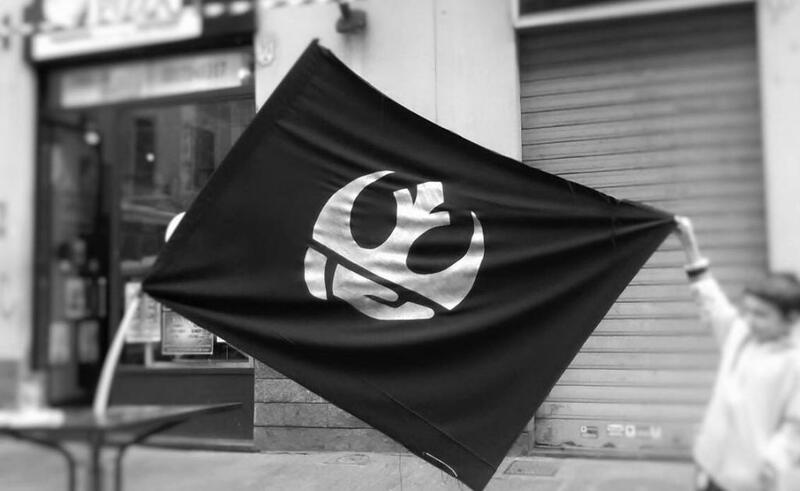 Public assemblies in Milan were held at social center COX, and in Turin assemblies were promoted by activists at the local university and at the social center Cavallerizza, while a solidarity dinner was held in anarchist squat Asilo. Further reflection should be given to the bigger picture. The truth is that Foodora was able to offer such low salaries (compared, for instance, with France where a rider gets €7.20 an hour + €2 per delivery) because the Jobs Act and previous reforms have deregulated the Italian job market and removed general protection for workers. When the deregulated market meets the hyper-fragmented employment form of Foodora it results in a terrible mix. Furthermore, Foodora has been accused of taking advantage of the high youth unemployment rate in Italy (around 40% in 2015, according to ISTAT): what the company terms a “side job” is, for the riders, one of the only ways to have an income. Luckily the struggles of the riders and many others keep our eyes open and our hopes high. You can find info and statements (in Italian) about the striking riders on their FB page: Deliverance Project. Feel free to express your solidarity to them, or on the Foodora FB page. Original article from the Struggles in Italy blog.